The last time I had gone on a true mineral-hunting “vacation” was way back in 2005, when I went to Bancroft, Ontario, the mineral-collecting capital of Canada. Needless to say, I felt I was quite overdue for another extended venture. Fortunately, I remembered an extended trip the Colorado Mineral Society (CMS), an area club, was organizing to the Delta area of Utah, in late September. The main attraction there is the well-known Topaz Mountain area, with its bounty of sherry-colored and clear topaz crystals, as well as myriad other gems for the ambitious collector. I had mentioned to a distant friend named Oren, who is from Michigan, that I wanted to go on the excursion and hoped I could get the camping equipment (not to mention general funds) lined up. He had told me that he has family in Salt Lake City, and would love to fly out to accompany me for some digging. I was halfway flabbergasted by his offer, and now had the drive to work out the logistics! 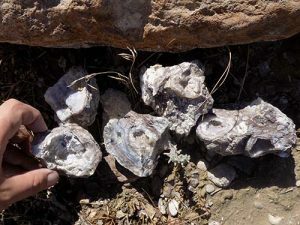 The Dugway geodes consist mostly of bluish-gray chalcedony bands within brownish to purple rhyolite. This rhyolite is geochemically distinct from that which hosts topaz. After a series of conference calls over several weeks, we were ready. The plan was for me to drive from Denver to Nephi, Utah, on a Thursday. Oren would meet me at my motel the next morning, and we would meet up with my club in Delta, 50 miles to the southwest. (Take state Route 132 southwest to U.S. Highway 6, and proceed south to Delta.) Oren was familiar with the area from a prior collecting trip, and had said he was excited to go back. Knowing this, I had a feeling this was going to be all worth it! Friday morning, after meeting at my hotel around 7:45 a.m., we started on our way from Nephi to the CMS meeting point near Delta, the gravel turnoff to Topaz Mountain from state Route 174. From the town of Delta, we took U.S. Highway 6 northeast for approximately 9 miles, turned left onto Route 174, and drove about 37 miles to the turnoff. The BLM sign reads “Topaz Mountain Rock Hounding Area”. Oren was quick to inform me that Route 174 is sometimes called “the loneliest highway on Earth”, and I noticed that we saw only two vehicles along that entire stretch of road! Other than one electrical power plant early on, there is nothing but vast, open desert, and there is no cellular service. The scattered gravel pits in the off-road area west of Topaz Mountain can yield decent Tiffany Stones in a variety of hues. was waiting. It was a surprisingly chilly day for being in the desert, and Oren and I were fortunate that we’d packed hooded sweatshirts. 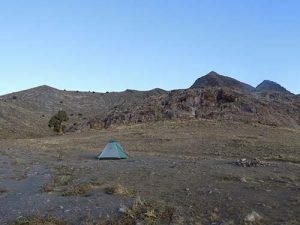 The group arranged itself into various carpools, and we drove another five miles north-northwest to the Topaz Mountain Adventures commercial claim. One of the claim owners, Rhonda, was gracious enough to let Oren and me ride with her. A four-wheel-drive vehicle is strongly suggested for the last two miles to the claim, as there may be washes in the dirt roads. En route, we spotted at least two sedans that had tried to venture all the way alone, but the dirt roads had proved too much for them. Rhonda asked both drivers if they needed rides, but they already had reinforcements coming to help. At the claims were well-established living quarters, complete with trailer, generator, two tents, and ’round-the-clock security. 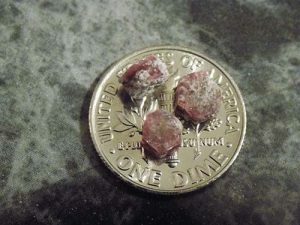 My total haul of red beryl crystals from The Amphitheater won’t make me rich, but the find is still wonderful enough to check off a geologist’s bucket list! the sight of an explosive blast at the area in which we were to collect, affectionately called The Dome. One lucky club member got to set off the charge while we watched from a safe distance away, at one of the group campgrounds. We had to wait 15 minutes for Rhonda’s husband, Dave, to clear off any high-hanging, potentially perilous, gravity-powered projectiles. In order to partake in collecting in the blast area, there was a fee of $75 per person with a limited capacity; we had the maximum of 15 people. For those who could not collect at The Cove, our field trip leader pointed out the best of the surrounding ridges for collecting bixbyte, pseudobrookite, almandine-spessartine variety garnet, and the ever-rare red beryl (a.k.a. “bixbite”). These ridges are also part of the Topaz Mountain Adventures Claim. I would be collecting topaz while Oren set off on a half-mile hike west-northwest toward an enclave in a ridge called The Amphitheater to find red beryl. The infamous topaz here is found in cavities within the host gray rhyolite, a rather challenging and energy-consuming rock to break if not approached correctly. 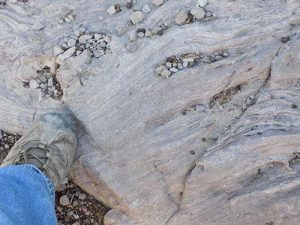 The trick here is to find rhyolite boulders that display prominent flow banding, coupled with extremely small, parallel vugs (typically 1 mm to 2 mm across), and pounding in the vugs with a chisel or pointed hammer. Of course, not every vug will yield gems, but I never felt excessively tired, and I never needed to pull out my 10-pound sledgehammer! The clouds and light rain that persisted throughout the day made finding nice flow bands somewhat more difficult. Alas, as a group, we managed to find only a few small, individual crystals, but Rhonda felt that, after two hours, we were not finding as much as we should. It was also around then that I decided to hike over and join Oren, bring him some lunch, and see what kind of luck he was having. Most of the sand topazes could be pried out with fingers, while some of the larger ones require a screwdriver to wedge out. We climbed up a few dozen feet to a flatter area that precedes a much steeper area. It was here that we started to see some small areas of sand-size sediment and clay alteration. Oren started to screen the sand near a small outcrop ridge, while I took a breather to do some photography—that is until I heard a resounding “Yes!” that reverberated around the amphitheater. Our entire mission had been accomplished by Oren finding our first red beryl! Our primitive campsite for the visit was on BLM (public) land, where small, clear topaz crystals can sometimes reveal themselves. The red beryl crystals here are semi-gem-quality and measure only 2 mm to 4 mm, but they are euhedral, with a characteristic stubby, hexagonal prism shape. I almost dropped my camera to join the hunt, as red beryl fever was now raging! In scouring the same area, and a little bit upslope, Oren and I found a total of seven small beauties. A memory that will forever be burned in my head was that, after some success, I asked Oren to take a “victory picture” of me with the vast mountains in the background. As soon as I found my footing, there was another red beryl right at my feet! After declaring total victory in the late afternoon, we decided to play it safe and started our trek downhill. As I was a little bit ahead, gathering up the tools I had left, I heard Oren say, “Mark, you are going to hate me!” He had found one more pair of crystals in a clay vug that I had just passed a minute ago! I wound up with three crystals, whereas Oren found six. He was nice, and gave me one of his crystals to even up our finds somewhat. For the first-timer here, the key to finding red beryl definitely lies in finding areas of white clay. The beryl, along with most other key minerals, precipitated within cavities in the rhyolitic (felsic) lava flows from around 20 million years ago. [The lava supplied silicon, aluminum, and volatiles/water (to make cavities), whereas later upwelling hydrothermal solutions supplied beryllium, manganese, and fluorine (with the beryllium & fluorine combination playing a role in forming the Tiffany Stones).] Along with these, alteration clays are frequently found in and around these cavities. 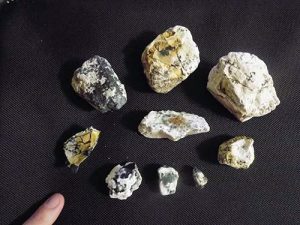 It should also be noted that the red beryls found here are different from the renowned, gemmy, larger crystals found in the Wah Wah Mountains, which can fetch $10,000 per carat. Although we didn’t make a fortune collecting our tiny beryl crystals, it is more than good enough to cross off my geologist’s bucket list! We returned to the claim homestead and showed off our new, red finds. Rhonda said that we could come back the next morning for another blast, since that morning’s had proved not very fruitful. With that, Rhonda drove Oren and me back to our campsite on the BLM grounds for the evening. Some of my loose champagne topazes were lucky not to get damaged by heavy hammering! 174/Topaz Road intersection. We were joined by some collectors who had not been present the day before. Oren and I drew up a game plan with another group to get the most out of our last full day. I would partake in the topaz blast again, with hopes of better luck, while Oren would ride with another pair, David and Jennifer, and go to nearby Antelope Ridge to hunt for almandine garnet. The four of us would meet for lunch at camp, then travel an hour north of the Topaz Mountain Adventures Claim to hunt for Dugway geodes. After witnessing the second blast and getting to know some new faces, we scrambled to the new site, just 50 yards or so south from the first blast. It was a bit more crowded than the first day, but not even 15 minutes had gone by before I picked up my first “pay-dirt” boulder near another person’s feet. It seemed like every other piece that I split yielded some crystals! In conversing with Dave, I learned that he and Rhonda were trying to follow a continuing crystal vein with their blasts, and that there were two possible ways to go. The unfruitful experience of the first day was simply a matter of unknowingly going the wrong way. The second day, they hit the true continuation. Dave also provided initial estimates on the worth of our finds—not that I ever intend to sell them! I had found a loose crystal with a small twin that could go for $25, whereas a USGS participant found a couple clusters that were easily worth $100 to $250! To make my eyes even greener, Dave regaled those within a moderate earshot that, earlier in the year, an independent prospector had visited and found over $1,000 worth of gem topaz! The wonderful thing about digging in the Topaz Adventure claims is that you keep all that is found, regardless of value. 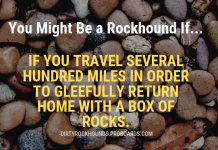 I met up with Oren, David and Jennifer for lunch and transferred my tools and newfound gems to their vehicle, and off we went toward the town of Dugway to look for chalcedony geodes. 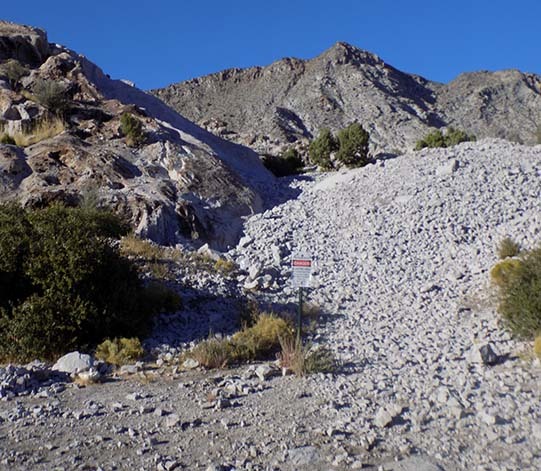 The trick to efficiently splitting the hard, gray rhyolite is to find boulders with prominent flow banding and hammering in the tiny, parallel vugs with a chisel or pointed hammer. The path up to the geode area is hilly and frequently narrow. We also had to backtrack and try several paths due to our GPS losing signal. We knew we had arrived at the geode claim when we saw a yellow bulldozer standing over a significant pit, as well as a rather visible claim sign. Someone at the topaz claims had said the claim had expired and we could explore the main pit, but were not 100% sure. Since we also didn’t have a cellular signal to call the phone number on the claim sign, we thought it would be best to collect in a smaller area just outside the claim markers. 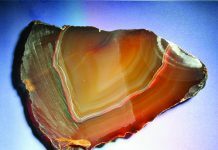 The Dugway geodes are hosted in a younger, darker brown-purple rhyolite that is 6 million to 8 million years old. Just like with the topaz-bearing rhyolites, later hydrothermal fluids deposited fine chalcedony in cavities, but lacked the elements required to form beryl. The geodes we found were mostly cracked open already, and didn’t offer too much in the way of cavity depth or color variety. The four of us walked away with three to four respectable geodes each. As of this writing, I understand that the area is still unclaimed. For how long it will remain unclaimed is anybody’s guess, so do your research before visiting! Upon returning to the topaz claims, Donna and I started to feel a little light-headed (probably from dehydration), while Oren and Jeff were supercharged and wanted to take another trip up to the amphitheater for more red beryl. After they left, Donna said that, knowing her husband, that duo would be up there until sundown! Although taking it much easier than the previous two times, I hammered on some rocks in the hopes that I would get as lucky as that aforementioned past prospector! I only ended up with one more small matrix specimen. Oren and David returned from the Amphitheater having found only one additional red beryl crystal, and we all decided to call it a day. Sunday morning, we got off to an earlier start, as Oren had to be back in Nephi to meet with family at 10 a.m. Oren’s main objective from the outset was to explore the roadside dry washes for diamondlike, colorless topazes. We mainly stuck to the washes on either side of Topaz Road, heading back out to state Route 174. I drove slowly along the path and stopped when Oren thought he saw sufficient “sparkle”. We stopped four times and explored each spot for 10 to 30 minutes. We ventured no more than 75 yards or so from the road, and found plentiful crystals. 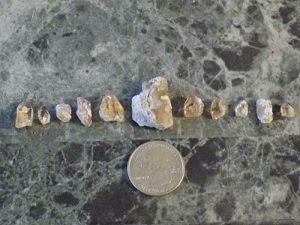 The largest found, by Oren, was a little over a centimeter long, and all of them had at least one perfect termination. In Tiffany Stone, the pattern and color combinations are quite numerous. The bull’s-eye piece (middle) is among my favorites. also have the best luck on a sunny versus overcast day (like on day one)! I wanted to try my luck at Antelope Ridge, near our camp, for some garnets, but alas, our time was cut short. 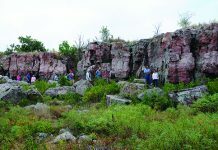 It goes to show that multiple trips are needed to fully explore for all the area’s treasures. 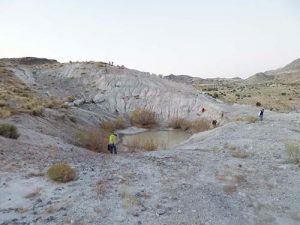 Venturing out, at least once, to the Topaz Mountain Adventures claim is a must on every rockhound’s bucket list, no matter where you live. Rhonda and Dave were among the best hosts I have ever gotten to know while visiting a private claim. 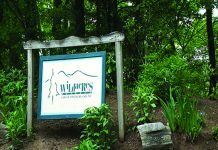 For more information, and to schedule a trip to the claim, visit www.topazmountainadventures.com.